The survival of any human society is inextricably linked to the health of its population. Since ancient times, human beings and societies have tried to discover rules and protocols that would enhance the chances of survival and sustained good health. 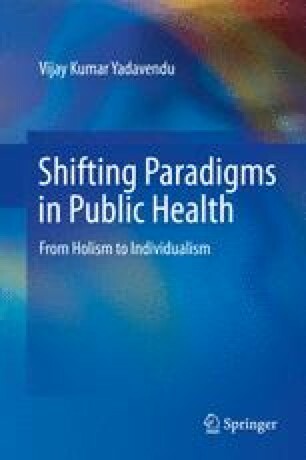 The term ‘public health’ reflects this concern for ensuring the health of a human collective. In sociological terms, the word ‘public’ implies the outcomes of interactions between individual human beings. There are two broad sociological perspectives in which it is possible to locate an analysis of the concept of the public. The first, the methodological individualism (MI), which is individualistically oriented social philosophy, views the Gestalt (a symbolic configuration or pattern of elements so unified as a whole that its properties cannot be derived from a simple summation of its parts) as the sum or outcome of actions and motives of distinct individuals. The second, methodological holism (MH) is collectivistically oriented social philosophy in which the causality runs the other way round where individual actions and motives are derivatives of the total, or the Gestalt. In the former perspective, the focus is on the individual, while in the latter the focus is on the collective or the social constellation of which the individual is a part.